Having figured out what to do, I started with the button, which is chromed plastic, nothing too fancy, and not at all hard to machine. 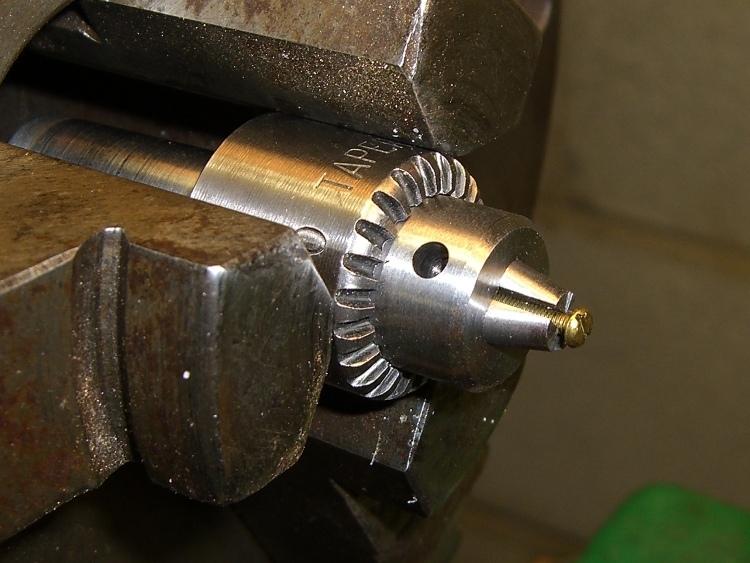 A small post turned from an acrylic rod (the gray cylinder) supports the button in the Sherline 3-jaw chuck attached to the mill table; that was the only way to keep it reasonably level. Laser alignment got eyeballometrically close to the middle; it looks a bit off to the right, but the end result was OK.
A 2 mm end-cutting bit chewed off the stem in short order; I set the jog speed to about 100 mm/min and just jogged down until the cutter was flush with the button. Spindle at 4000 rpm, for lack of anything smarter. I decided to go with a 1-72 brass machine screw, which is slightly larger (1.75 mm) than the original 1.5 mm button stem. That means I must drill out the bezel hole, as well, but the 1.5 mm diameter of the next-smaller 0-80 screws in my assortment was a sloppy fit. 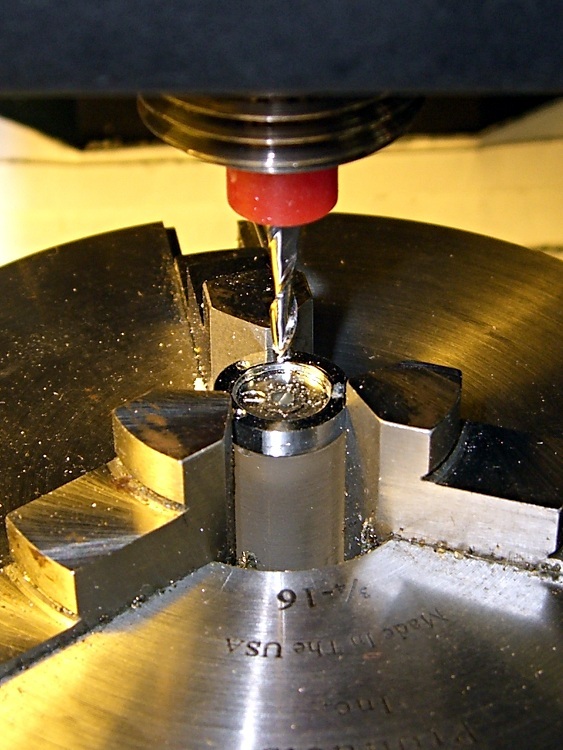 The spindle was slow enough and the feed fast enough to keep from melting the button without applying any coolant. The 3-jaw lathe chuck doesn’t grip a 1-72 screw (no surprise there), so I grabbed the screw in the Sherline’s smallest drill chuck and poked that in the lathe. This doesn’t make for great concentricity, but it was close enough. The right way, as my buddy Eks reminds me, is to slit a nested bunch of brass tubing and use them as collets, but … next time, fer shure. Anyhow, here’s what the button & screw look like so far. The backside of the screw head looks like it needs some cleanup; there’s nothing like taking a picture to reveal that sort of thing. The pencil lead is 0.5 mm and the grid in the background has 1 mm squares, just to give you an idea of the scale. This entry was posted on 2009-08-28, 07:22 and is filed under Machine Shop, Photography & Images. You can follow any responses to this entry through RSS 2.0. Both comments and pings are currently closed.